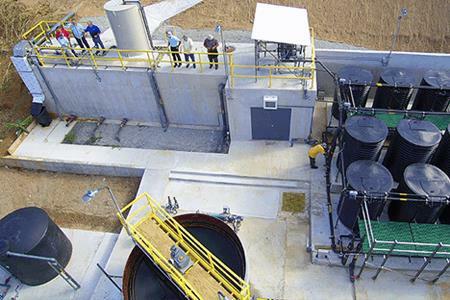 Activated sludge treatment has long been used for aerobic wastewater treatment, but its aeration stage is particularly energy-intensive, which makes it less cost-efficient as a step in decentralized water reuse. At Fluence, our self-respiring membrane aerated biofilm reactors (MABR) provide an energy-efficient alternative. MABR is based on passive aeration, that is, the diffusion of oxygen through membranes. During the process, an aerobic nitrifying biofilm develops on the surface of the membranes, which enables simultaneous nitrification and denitrification (SND). This minimizes carbon deficiency and results in low total nitrogen in the effluent. Are you looking for an energy-efficient wastewater treatment solution? MABR could be just what your operation needs. These small- to medium-capacity plants save up to 90% on energy use, compared to conventional plants. Contact our experts to discuss your specific project details, and learn how MABR can help you meet your goals. Fluence’s self-respiring membrane aerated biofilm reactors(MABR) are modular and reduce energy usage by up to 90% compared to conventional treatment. MABR modules are a customer-focused wastewater treatment solution suitable for small capacities in the range of 15-30 m3/d. Spirally wound membranes packed into standardized polypropylene tanks are equipped with everything needed for use as a biological reactor. The standardized modules and design lower plant cost and allow for gradual expansion. Remote monitoring and control are also available. All process units – for example, mechanical screens and secondary clarifiers – are customized for each plant. Modules can be connected in parallel to meet the required treatment capacity, and more can be added to expand capacity as needed. To optimize performance, groups of modules are usually arranged in two process stages. The process design is based on the activated sludge process, with a secondary clarifier and return-activated sludge (RAS) circulation. Pretreatment includes fine screening, followed by oil and grit removal, then an equalization tank and the biological treatment stage. Tertiary treatment, such as filtration and disinfection, is compatible with the process and can be provided separately. The containerized MABR is a robust, plug-and-play building-block solution. It’s quick to install and provides an ideal wastewater treatment solution suitable for small villages, residential communities, resort hotels, and more. Each unit has up to five spirally wound, self-respiring membranes that provide aeration for the process. They’re installed in a steel tank the size of a shipping container, which functions as the biological reactor, including all process connections. The containers are a standard size, but the treatment capacity of each varies from 50-150 m3/d, depending on effluent requirements and design temperature. Several containers may be connected in parallel to handle flow up to 2,000 m3/d. All process units, e.g., mechanical screen and secondary clarifier, are customized, and plumbing between the main process units is installed onsite. Pretreatment mainly includes fine screening followed by oil and grit removal. When phosphorous removal is required, an anaerobic tank is provided upstream of the containers. Tertiary treatment such as filtration and disinfection are compatible with the process and can be provided separately. In this solution, MABR’s spirally wound, self-respiring membranes are installed in a concrete basin. A concrete MABR plant is ideal for medium capacities of 500-2,000 m3/d. They’re suitable for villages, new neighborhoods, small municipalities, and more. The concrete plant process design is based on the activated sludge process. It includes a rectangular clarifier and other features such as sludge storage and a secondary effluent tank. An anaerobic chamber equipped with mechanical mixing is included when phosphorous removal is required. Tertiary treatment such as filtration and disinfection are compatible with the process and can be provided separately. Part of the basin volume on the downstream side can be left without membranes for operational flexibility and future expansion. 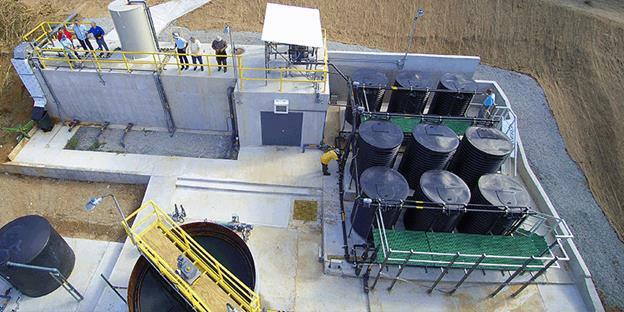 Easy-to-install concrete MABR wastewater treatment plants are highly energy-efficient and cost-effective, and built-in nutrient removal ensures high effluent quality. The Bordeaux area of St. Thomas required a wastewater treatment plant to replace an old one that didn’t meet environmental regulations or industry standards. An MABR plant was designed, delivered, and started providing high-quality effluent within seven months. 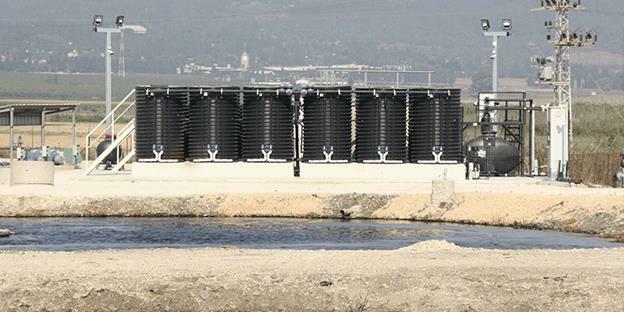 It economically provides wastewater treatment for 200 homes, and can be easily expanded if required. The plant’s quiet, odorless performance was important on the island, which relies on tourism. The plant achieved EPA region 2 approval in March 2017. Visit Fluence online for more details on this project. When a residential development in Israel wanted a localized wastewater treatment solution to replace its existing pond system, it needed an odorless, quiet solution that would be energy-efficient, handle a high-nutrient stream, and use existing pond structures. The plant uses our revolutionary MABR technology to treat 123,000 L/d, producing high-quality, reclaimed water suitable for agricultural reuse. Visit Fluence online for more details on this project.